It started like any other day. Across America, we woke up to get ready for work. We had a cup of coffee. We fixed breakfast. We kissed our loved ones goodbye. And then we turned on the news. When we heard an airplane hit the North Tower, many of us couldnt believe it. It had to be an accident. We wondered how it could possibly happen, and as newscasters asked the same questions racing through our minds, we saw the second plane. We watched in horror as it crashed into the South Tower. And then we knew. This was no accident. And our lives would never be the same again. 2,996 people lost their lives on September 11, 2001. 6,000 more were injured. We lost 343 firefighters, 72 law enforcement officers, and 55 military personnel. The attack was the single deadliest terrorist attack in world history. 500 more people were killed on 9/11 than in the attack on Pearl Harbor during World War II. Throughout our history, people have sold America short. The British sold us short in the 1770s until Yorktown. The Confederacy sold us short until Appomattox. The Spanish sold us short until Manila. The Axis Powers sold us short until D-Day. The Soviets sold us short until the Berlin Wall fell. At every turn, Americans rise to the occasion. President Ronald Reagan once said that, One of the worst mistakes anybody can make is to bet against Americans. One of those occasions was in 1943. The United States was in its second year fighting World War II. Many of our nations nurses had gone overseas to serve in the military, leaving our civilian hospitals critically understaffed. We needed nurses, and fast. As a result of the crisis, President Franklin D. Roosevelt signed a law creating the United States Cadet Nurse Corps on July 1st, 1943. The program, administered by the United States Public Health Service, truncated 36 months of training into 30 months. It did not discriminate on the basis of race or ethnicity. Students were eligible for a government subsidy to pay for tuition, textbooks, uniforms, and to cover a cost of living stipend. In exchange, the students pledged to serve wherever needed in essential civilian or federal government services until the end of World War II. The program ran from 1943 until 1948. Over 179,000 nurses were enrolled in the program with a seventy percent graduation rate. Eighty-seven percent of the nursing programs in the country participated in the program. One such school was right here in Freeport at the old St. Francis Hospital. St. Francis was the first hospital in Freeport, opening its doors on February 12th, 1890. It developed a nursing school that trained hundreds of nurses by 1923, and in 1943, began training nurses through the US Cadet Nurse Corps training program. Dorothy Elaine Ellis (nee Ditzler) was one of the cadets trained at St. Francis. She grew up on a farm in Winslow, Illinois and began her training on September 1st,1944 when she was 17 years old. Her son, Bob Ditzler, says that Dorothy served because she is a patriot who answered the call of duty. She has always had a caring, giving personality with compassion for mankind and sympathy for others, especially service members. Bob provided me with information about his mothers service, hoping that she could be recognized for her service by the Illinois Department of Veterans Affairs. 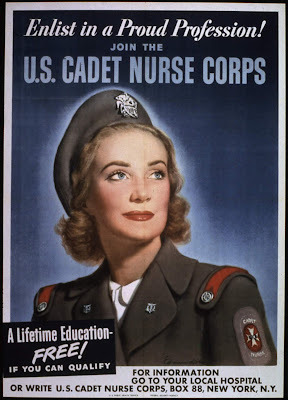 As it turns out, the US Cadet Nurse Corps is the only uniformed corps, commissioned during World War II, whose members have not been recognized as veterans. In a message shortly before signing the Emancipation Proclamation, President Lincoln wrote, The dogmas of the quiet past, are inadequate to the stormy present. The occasion is piled high with difficulty, and we must rise with the occasion. Americans have a history of rising with the occasion. We saw it on 9/11 and in the days and months that followed. We saw it during World War II, including the creation and development of the US Cadet Nurse Corps. I would like Springfield to pass a resolution thanking nurses like Dorothy Ellis-Ditzler who were trained at St. Francis and throughout Illinois for their service to their country. I would also like the resolution to call on Congress to pass HR1168, called the US Cadet Nurse Corps Equity Act. It would declare that US Cadet Nurse Corps members - who served between 1943 and 1948 -would be issued an honorable discharge from the Department of Defense and be qualified as veterans. On Tuesday it will have been 17 years since the fateful morning of September 11th. Much has happened over the years. Many of us have loved. Others have lost. Children have been brought into the world as friends and family have passed on. We've come so far and accomplished so much. But there is one thing that should not, that must not, that will not change. We will never forget. Not ever. And we will always rise.